Richman recalled that Apple amassed $4.976 billion in revenue from the sale of 3.76 million Macs during its previous quarter, yielding an average selling price of $1,323.40 per Mac. He then multiplied that figure by a 28% gross margin estimate for Mac sales from Jefferies & Co. —which is still several hundred basis points below the company's reported average — to arrive at a profit of $370.55 per Mac sold. 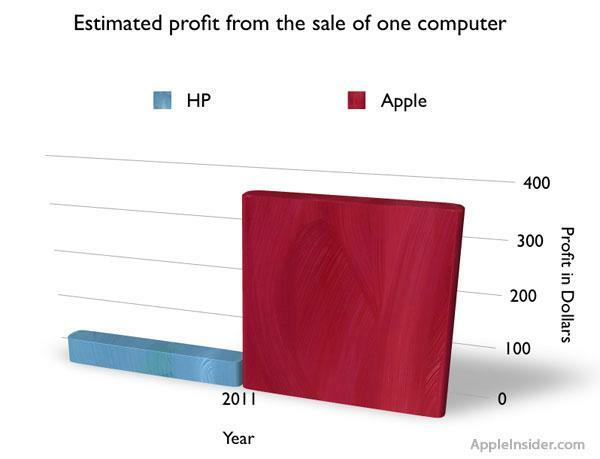 By comparison, HPs Personal Systems Group brought in $9.415 billion in revenue and turned a profit of $533 million last quarter. The PC maker's operating margin, which doesnt factor in overhead costs, came in at 5.66%. "If we assume they spent 1% of their $9.415 billion in revenue  $94.15 million  on operations, then their profit margin was 6.66%," Richman wrote. "But lets give them the benefit of the doubt and make it 8%." "Numbers like these have to scare the hell out of Apples competition," wrote the Loop's Jim Dalrymple, who was first to draw attention to Richman's revelation.